Used by many top pipers and tutors around the world! Practice pipes, as the name implies, are ideal for learning and improving playing. The reduced volume is the perfect sound level for indoor playing and music sessions with other instruments. The set includes the bag, blowpipe, chanter, bag cover, reeds and drones (one tenor and one bass). This set is made using modern materials designed to provide a very traditional tone with the added convenience of synthetic reeds and drones; it's easy to tune and maintain, and folds up into a compact case that can go anywhere. Drones are tunable simply by adjusting their length using the inner and outer metal tubing. Also an excellent set for transitioning from the practice chanter to the full size bagpipes. This is a very slick product! Highly recommended! 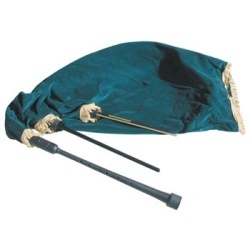 The carrying case is approximately the size of a flute case, and is made of a tough fabric, with double handles. PLEASE NOTE: From time to time, the manufacturer makes small changes to the bag cover, in both fabric type and color, and there may or may not be fringe. The case may also have some variations. We have no control over these changes. If this is a concern, please call or e-mail before ordering.